Today I went to my local market. Tuesday is car boot day. I haven’t been since before Summer, so it was nice to have a wander around. 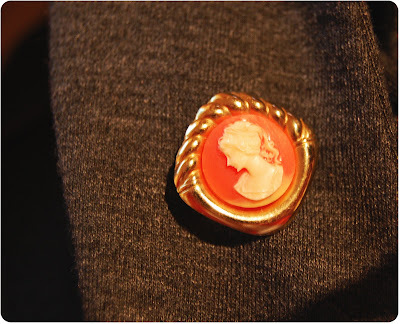 I got this gorgeous cameo brooch for just 20p! Looks gorgeous on one of my boyfriend blazers, and complements my Zara scarf that I featured the other day perfectly. I absolutely adore it! Also was just having a gander on Vogue.com, and came across this image of Taylor Momsen from Gossip Girl. She must have the longest legs I’ve ever seen! She pulls of the micro mini so well, and her hair is to die for! Green eyed monster is back again! Finally, also on Vogue.com, I came across a Kate Moss style file. Just look how much the lady has changed. From baby faced in her early career as the face of Calvin Klein, to yet ANOTHER Vogue cover this Autumn. She looks just as stunning, if not better now. All hail Queen Kate! Tomorrow I am going into work to help decorate our new training room. Should be fun! 5 days to go before I jet off to Egypt!